To the credit of the Committee on Judicial Conduct and Disability (of the Judicial Conference of the United States), it just issued two opinions refusing to hide judicial misconduct. The first involved former Chief Judge Cebull (D. Mont.) who had forwarded hundreds of racist, sexist, homophobic, and political emails from his court email address. Because of an intervening event (namely, Judge Cebull’s decision to retire), the Ninth Circuit Judicial Council had effectively redacted portions of its earlier order detailing Judge Cebull’s misconduct and imposing several sanctions. The Committee on Judicial Conduct and Disability concluded that the Council had erred and republished the full order here. The second instance involved former Sixth Circuit Chief Judge Boyce Martin who had asked the Judicial Council to remove his name from its published order and not to refer him to the Department of Justice for further investigation into his problematic travel reimbursements. In the face of the judicial misconduct investigation, Martin retired and agreed to pay back $138,500 in reimbursements. Notwithstanding these steps, the Committee saw no reason to overturn the Judicial Council’s decision to publish Martin’s name and to refer the misconduct to prosecutors; see here. Judicial opinions are the core work product of judges; they should be tangible proof to the parties that the court analyzed their claims or defenses and independently reached a reasoned decision. Yet courts often request that parties prepare proposed findings of fact and conclusions of law and thereafter adopt the prevailing party’s findings and conclusions verbatim or nearly so. In other cases, courts copy portions of the winning party’s brief or legal memorandum into their opinions or orders without attribution. These practices are fairly described as “judicial plagiarism.” The limited case law on-point establishes that if a court’s verbatim adoption of a party’s positions or its replication of a party’s brief reflects a lack of independent analysis or reasoning, or an apparent abdication or delegation of the court’s judicial function, it may furnish grounds for reversal. Grounds for reversal should also exist if judicial plagiarism reasonably evidences a court’s alleged bias or partiality. This Article goes farther, however, to argue that judicial plagiarism may constitute judicial misconduct for which the offending judge may be disciplined under the Model Code of Judicial Conduct. Deciding whether judicial plagiarism rises to the level of judicial misconduct or whether it is simply a judge’s ill-considered stab at efficiency is a difficult inquiry. To aid in this important determination, the Article identifies factors that higher courts and judicial conduct authorities should consider in the process. The Article also explains why courts’ and scholars’ long-standing defenses of judicial plagiarism fail. 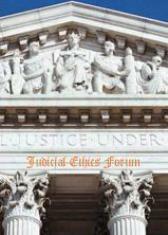 Douglas R. Richmond, Unoriginal Sin: The Problem of Judicial Plagiarism, 45 Ariz. St. L.J. 1077 (2013).